For most of us, the idea of a culinary show is an extremely sophisticated cook off between experienced chefs. Ever wondered what a show featuring a team with no professional cooking experience would be like? Harley Morenstein and his kitchen crew, with no professional culinary experience, follow no thumb rule of cooking and are out to make some spectacular inventions. 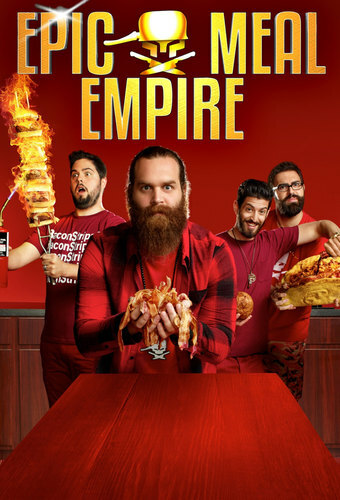 FYI TV18’s all new show, Epic Meal Empire, premiering on 30th March, 2018 every Friday and Saturday 7 PM, will follow the team as they deliver recipes that are visually mind-blowing spins on food preparation and presentation. Most people on a diet would know the value of that one cheat meal that keeps them going. However, for Harley Morenstein and his friends, a great idea spawned after they created an elaborate cheat meal – ironically, amid efforts to promote health and fitness. The team discovered their passion for cooking and in 2010, Harley created a YouTube show called ‘Epic Meal Time.’ It was so popular that he quit his teaching job in Montreal and focused on making more episodes. After racking up 600 million YouTube views, the talented kitchen crew is now ready for primetime television. The team combines ingredients like waffles, chicken hearts, cake mix, maple syrup, bacon grease and whiskey to invent mouthwatering recipes. The show provides a platform to Harley and his extremely talented crew, with little professional experience and helps them in bringing their passion for gut-busting concoctions to the small screen. So get ready to embark on this culinary adventure and visually treat yourself with some Epic Meals.